Those lowly plastic ice cube trays that have gone by the way side with all the automatic ice makers out there today, can be repurposed in a variety of ways other than ice to save you money and time. Never throw out little leftover bits of sauces/gravies/purees again! The next time you see them at a yard sale, thrift store or even the dollar store pick a few up! Quite a few liquids and sauces can be frozen for use in cooking and household cleaning. If you are looking for new ways to be frugal and live a frugally sustainable way of life, this is a great habit to get into. It makes you look at what your throwing out in a whole new way! 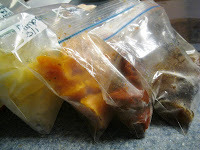 I always have ziplock bags of ice cube foods lined up in my freezer, and you should consider it too! Not sure how much to use in cooking? 1 standard sized cube = 2 Tablespoons , 2 cubes= 1/4 cup, 4 cubes = 1/2 cup, etc. 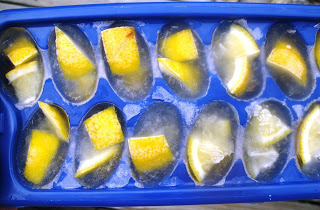 Place pieces of lemon in each ice cube slot. Fill each slot with vinegar. Freeze. When cubes are frozen, pop them out into a ziploc bag labeled as garbage disposal cleaner and store in freezer. To use: Place 1-2 cubes down disposal, turn on the water and run the disposal. The vinegar and lemons will clean the disposal as they whirl around. I love to substitute pumpkin puree or applesauce in my baking in place of the oil in a recipe to reduce the fat. Whether you make your own pumpkin or buy a can (not pumpkin pie filling,just plain ol' pumpkin!) either will be just fine! Just, fill your ice cube trays. Freeze solid, then pop out of trays and store in labeled ziplock bags in freezer. Just pull out what you need based on the measurements mentioned earlier and microwave to thaw. Sometimes you just need a tiny bit of tomato paste to thicken up your favorite sauce or soup. A whole can, no matter how small, is still just too much. So open a small can, fill your trays (I get about 8 cubes per can) and freeze till solid, pop out into a labeled bag and store in freezer. Just pop a cube into your sauce and watch it melt right into your dinner. Also little bits of leftover spaghetti sauce from dinner is great to freeze into cubes, no more waste! Ever find that you have just a tiny bit of left over gravy and not sure what to do with it? For heavens sake, don't throw out all that flavor! Just pop it into your trays and freeze. Store your cubes in labeled baggies in the freezer. The next time you are making soups, casseroles, or even opening a store bought soup, pop a cube or two in for great flavor! Same if you cook meat in your crockpot or oven and get a bit of broth from it. My kids love smoothies. To make it easier, you can freeze vanilla yogurt, or even mashed up fruit. Hey, we all end up with that one brown banana that no one wants to eat. Just mash it and freeze it for smoothies. (mashed banana can be used as an egg substitute too!) Same with any extra fruits. then pop into the blender with your other smoothie ingredients and wala, smoothie is done! I do not drink coffee or tea, so have no experience with this, but my coworkers are always dumping cold coffee out at work. What if you froze it or even Chai Tea Concentrate to make your next cold coffee drink? If you have some herbs in your fridge that are getting a bit old, consider chopping them up and putting them in the ice cube slots and then fill each slot with water. These herbed ice cubes are great to pop into homemade soups and other dishes! Before the days of magic bullets and food processors I made my own baby food. It's a heck of a lot cheaper and with today's gadgets even faster then ever! I've seen those baby bullets and they look so cool,but I usually stored a much larger variety than the number of those cute little containers, plus you don't need to spend the money on it. Make them into ice cubes and store in labeled bags in the freezer. Then pull out what you need and thaw carefully in the microwave. You can even mix those weird blends your baby likes, such as pears and squash, etc. all in the same cube! I'd love to hear what you like to use your ice cube trays for!